First of all, Tracey O'Hara (who's book I reviewed here) will be stopping by soon with either an interview or guest post - any preferences which? I'm also going to try and add a section at the top of the blog with a list of our 'coming soon' events. The other thing I wanted to mention was, although it's still quite a way away, I want to do a giveaway when we reach 100 followers. I'm not certain about prizes yet, but I'm thinking of using a site like Book Depositry, so that I can keep it an international contest, and hopefully offer more prizes. There will be extra points if you're already a follower when the contest starts, so if you're reading but not yet a follower, this is maybe the time to press that button! Tynga at Tynga's Urban Fantasy Reviews gave us the 'Honest Scrap' Award, which is for bloggers who write from the heart. The rules are to list 10 honest things about yourself, and pass it on to 10 other bloggers. 1) I'm going to the French Alps on December 9th, to spend the ski season working in a small hotel. 2) I'm going to Edinburgh University next September to study Ancient & Medieval History, although I think I'm going to do some English/Literature bits too. 3) I live in the middle of nowhere, my primary school had 20 kids when I started, 50 when I left. The high school is a 20 minute drive away, and has a total of 500 pupils. If you want to get to the city, (& more importantly the nearest big bookshop) it's a two hour drive. 4) I got to be one of the 'cub reporters' at the launch of HP 6, the Half Blood Prince. It was a fantastic experience, and my signed book is kept carefully out of harms way. 5) I always do home made Christmas cards for my friends and family - I'm starting this year's batch this weekend. 6) This winter will be the first time I've lived away from home, as well as my first Christmas and birthday without my family. 7) My two favourite movies are 'I, Robot' and 'National Treasure'. 8) I've got two dogs called Malin & Brodie. Malin is the shipping area closest to where we live. We didn't name Brodie, because he was rehomed to us. 9) I'm useless at tidying my room, but I always know exactly where everything is in the jumble on the floor. 10) I have two main screen names - gapyeargirl is fairly obvious - I'm a girl, on my gap year. The other is Daeonica, which is the name of a play in one of my favourite books, The Name of The Wind by Patrick Rothfuss. I chose that one when I was looking for something unique that no one else on forums would have already. I'm really picky when it comes to children's picture books because you can't just go out and pick some random story. It has to be able to keep the child's attention with both the magnificent pictures and the words that go with them. Pingo does just that. I really love the art by Brandon Dorman. He has brought an imaginary character to life through the beautiful renderings in this book. The words of the story are fairly simple to read aloud to children. But then again, Brandon Mull does have a wonderful knack for making his stories family friendly. It is the most absolute cute story about a boy and his imaginary friend. 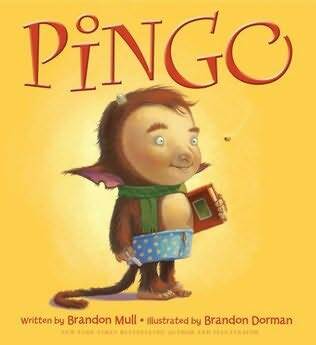 At one time, the boy decides that Pingo needs to go away, that he doesn't need an imaginary friend anymore. After that, Pingo became the boy's imaginary enemy throughout the rest of his life. It's a very adorable story that shows us that we should never give up our imaginations for anything. I got this for my little one and I've been asked over and over again to read it aloud. If you need a really good picture book for your kids or whoever you think would like it, go ahead. Just remember, after you read this endearing story, Pingo stays with you for life. I mean, you don't want an imaginary enemy would you? SPOILER ALERT! If you have not read The Hunger Games, I suggest you not read this review. Against all odds, Katniss has won the Hunger Games. She and fellow District 12 tribute Peeta Mellark are miraculously still alive. Katniss should be relieved, happy even. After all, she has returned to her family and her longtime friend, Gale. Yet nothing is the way Katniss wishes it to be. Gale holds her at an icy distance. Peeta has turned his back on her completely. And there are whispers of a rebellion against the Capitol--a rebellion that Katniss and Peeta may have helped create. Much to her shock, Katniss has fueled an unrest she's afraid she cannot stop. And what scares her more is that she's not entirely convinced that she should try. As time draws near for Katniss and Peeta to visit the districts on the Capitol's cruel Victory Tour, the stakes are higher than ever. If they can't prove, without a shadow of a doubt, that they are lost in their love for each other, the consequences will be horrifying. When I received this book in the mail, I was very excited to be able to read it. However, I had to lay off because I knew that if I picked it up, I wouldn't be able to put it down. And that is exactly what happened when I got to reading it. There are many book series or trilogies that get me hooked. Hooked enough to keep reading the series. But Suzanne Collins has me reeled in with the bait in order for me to see how the third and final book will bring this story to an end. If you are like me and love getting hooked so much much that you can never let go of the story, grab this book and start reading. Don't get me started to tell you about the plot. I'm not giving anything away. I hate it when that happens and someone tells you the end of the story. I'm not that kind of reviewer. I will give hints most likely in my review, but I will not ruin the plot. 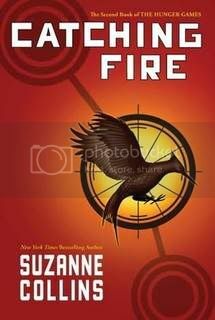 I love the twists and turns that Suzanne pulls us through as if we, the reader, were indeed the main character, Katniss. I don't know how many times I said out loud, "I did not see that coming." Or, "WHAT THE?!?" It was a strange thing for me to do something of the sort during a book. I am usually pretty good at guessing where a plot will run and how it get there, but Suzanne Collins takes a new twist to this story than I couldn't have ever guessed. All I have wanted to do since reading The Hunger Games, is meet Suzanne and shake her hand and give her a standing ovation for her creations. I love her characters so much. The complexity makes my mind fumble over itself trying to wrap myself around them and what they are going through, in their minds and in their lives. I feel as if I am either Katniss Everdeen or I am such a close friend to her that she is practically my sister. I really felt like I could relate to Katniss at moments in the story. Like I did with The Hunger Games, I tried to keep up with Katniss and be one step ahead of the story. Obviously, it didn't work out so great. Suzanne takes us even deeper into the romance territory with her male characters, Peeta and Gale. If you wanted a love triangle, you got it. Don't ask me to choose who my favorite guy is of the two and who Katniss should choose because I would tell you, "Both." I have only read of one male character written so self-sacrificing for the woman he loves as well as both these guys are and that was in A Long Fatal Love Chase by Louisa May Alcott. I'll review that one later. All I have to say for now on these two boys is, "Move over Edward Cullen and Jacob Black. Here come Peeta and Gale." Without a doubt, this book makes me feel the emotion, the sweat and the anxiety. I can really become part of it with how it is written in present tense and presented in a first person point of view. This book keeps me thinking about my own life and what I'm doing to keep it from going overboard. I love Suzanne Collins style of writing and will never get it out of my head since I will be reading and re-reading these books until the spine breaks. In that case, I'll just go get another copy. I recommend, Catching Fire, for those who are not faint at heart. There are disturbing images that may enter your mind (for you vivid imagineers). But for those who have read The Hunger Games and couldn't put it down, just remember, when you pick up Catching Fire, make sure you have all day to yourself. Do what you need to do in order to be all by yourself with no disruptions or distractions as you dive back into the world of Panem. On My Wishlist is a new weekly meme hosted by Book Chick City. I have a huge wishlist, and I'm always adding to it, so I thought it would be a fun thing to join in with! I thought I'd start with a couple of the books from my BookMooch wishlist that I really really want - of course, that's a lot of them, so I'm going to work my way down alphabetically week by week. 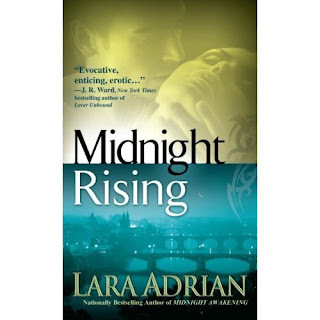 1) Midnight Rising, by Lara Adrian. I love this series about the Breed. Along the lines of the Black Dagger Brotherhood, each book is about one member of the guardians, and how they find their Breedmate - a human woman marked with the shape of a teardrop falling into a crescent moon. This book is Rio's story, and while I'm not as interested in him as some of his companions, I'm looking forward to learning more about him, and seeing what happens to the rest of the gang next. I think these books sound quite interesting - I've read the first couple of chapters of this book, and I'd love to read the rest sometime. Blurb, from the site: Harry Dresden is the best at what he does. Well, technically, he's the only at what he does. So when the Chicago P.D. has a case that transcends mortal creativity or capability, they come to him for answers. For the "everyday" world is actually full of strange and magical things -- and most of them don't play well with humans. That's where Harry comes in. Takes a wizard to catch a -- well, whatever. There's just one problem. Business, to put it mildly, stinks. So when the police bring him in to consult on a grisly double murder committed with black magic, Harry's seeing dollar signs. But where there's black magic, there's a black mage behind it. And now that mage knows Harry's name. And that's when things start to get... interesting. What's on your wishlists this week? Once again, a late & extended edition, because it appears I can't spot Sundays as they whoosh past. Here are the books I've received recently. Also, I have a question for you guys. Are you interested in reviews for later books in a series? I've got books 5 & 6 of the Sookie Stackhouse series - would you be interested in reviews for books like that, that are quite far on in a series? I'm a character driven reader, plot obviously is essential but i love to think and examine the underlining motives/reasoning of characters (did i mention i'm a psychology person aka psych). I love themes too and unusual concepts or experimental ways of writing - essentially outside of the box stuff. I also like shades of grey in writing, where it isn't obvious who the true villian is, or if it is obvious the 'villian' is extremely complex and not a cardboard cutout. That being said, i always enjoy reading well written fiction - whether its literary or genre - whether its character or plot driven. Reading (and writing) is a subjective art. I might hate something which everyone will go GaGa over. 5 stars - meeh! Alright but nothing to write home about. Basically a once reader which will eventually be donated to local library/charity shop to make room for 10 stars books. 1 star - i didn't get past the first chapter and if i did - my eyes are now bleeding from the awfulness. More than likely i won't even bother reviewing said book - not worth the energy. Time to announce the winner of the contest! We loved the acrostic she wrote. 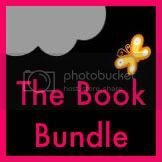 Llehn, I'll be posting the books to you this week - sorry for the delay! I'm a little bit behind on my reviews, folks, so I'm hoping to get a lot of them up for you over the next couple of weeks. I'm also going to add a couple more things to the site - review criteria, etc. For centuries war raged between the humans and Aeternus vampires - until courageous efforts on both sides forged a fragile peace. But the rogue Necrodreniacs will never be controlled - addicted as they are to the death-high... and bloody chaos. Since witnessing the murder of her mother, Antoinette Petrescu has burned with fiery hatred for the vampire race, even for Christian Laroque, the noble, dangerously handsome Aeternus who rescued her. Now an elite Venator, Antoinette must reluctantly accept Christian's help to achieve her vengeance - even as he plots to use the beautiful, unsuspecting warrior as bait to draw out the bloodthirsty dreniacs. As you all should've guessed by now, I'm a big fan of vampire romance stories, so you won't be surprised that I liked this book. This story has a great opening chapter - readers are pulled straight into Antoinette's daily life, as she stalks then fights with one of the evil Necrodrenics, or just dreniacs for short. It's clear she's good at her job of hunting them. We also meet Christian, who is watching the lair Antoinette is about to attack. He's passingly curious about her, and fate soon leads them to be working together. The two are very different, and sparks fly immediately - despite the fact that they are working towards the same goal, they have very different motivations. To start with, I didn't really like Antoinette as a person - she's very prejudiced against vampires, and, even if she thinks she has good reason for it, I hate prejudice. Christian and his friends soon make her reconsider, though, and her initial resentment of Christian turns to a passion that makes for some quite interesting situations. This is essentially a murder mystery. They know who the bad guy is - it's tracking him that's the problem, and working out where the other bits and pieces fit in to the story. Just as big a part of the story, though (if not more) is the relationship between Christian and Antoinette. While it was a bit predictable that they would get together, I didn't mind that - I like that in these books, it's why I read them, so it wasn't an issue for me. It annoyed me a bit how much Antoinette fought against the relationship. She gets angry too quickly, and still lets her rage and prejudice get in the way. I liked the relationship Antoinette formed with Viktor, Christian's best friend - they get quite close, and she lets herself be normal with him, and enjoys his company. I wished she could give that easy acceptance to Christian, too. The story was very enjoyable, but there was something about the writing that just got to me a little bit. Something about it just didn't quite seem to click for me, but it wasn't anywhere near enough for me to put the book down, and I'll definitely be picking up the sequel when it comes out. The book stands very well on it's own, so I'm curious about what will happen in the next book. There is a lot of unsettlement in the politics of Antoinette's world, so I'm hoping to read more about that, and see what becomes of some of their organisations after the revelations and events in NCK. A good book for paranormal romance fans, although it is quite a dark story, I would definitely recommend this book. I give it 7 out of 10 stars. I'm happy to review most genres of books, although my favourites are urban fantasy, paranormal romance, fantasy, contemporary romance or historical. If it has some supernatural element to it, I will often be interested. I'm also very happy to read mystery stories. For the most up-to-date idea of what I'm reading, have a look at what I've reviewed recently, or my wish list on amazon (here). I accept both print and e-books, but print will be prioritised. I'm getting pickier just now about what I review, because I prefer to talk about books I've loved than books that just hit me as 'meh'. I've got a lot of books I've been buying for myself which I'm excited about, and I don't want to feel pressured to review other things over those ones. As I say above, I'm much more likely to be interested in something similar to those on my wishlist or what I've review recently. Characters: As I mentioned above, characters should change over a book. Sometimes this is more noticeable with a series, but there should always be something that’s clearly different at the end compared to the start. If I care about the characters, that’s another good thing. Beginning: Something that starts quickly, and gets me hooked quickly. Ending: Are the main questions answered? I don’t mind a few things being left loose, but too many, and it’s not ok unless there’s a sequel. Dialogue: If it seems natural, realistic. Romance elements: Don’t make it happen too fast. I’m ok with a little bit of this, but I’m getting kind of fed up with it now. Please note that a book can meet all of these criteria and I still won’t like it. The biggest thing that makes up a book review is opinion. Sometimes I hate books that meet these points, sometimes I love books that have nothing in common with the above list. 5/10 = It was ok, but could have been a lot better. Didn’t really pull me in. So as a graduation treat i bought a load of books, one of which was Charlaine Harris' omnibus edition of her Sookie Stackhouse series. I opened the page of 'dead until dark' this morning and have just read the first book! Brilliant and such a fun read. Definitely a guilty pleasure to read. Although i imagine everyone in the entire universe has read these books already - i highly recommend them to all, especially vampire fans. My only thing is the back said 'move over bella. sookie stackhouse is here' - its really really important to remember (especially twilight fans who believe this series is a twilight knockoff) that these books were published 2001 and have won awards etc. so my recommendation to twilight fans is don't go in judging the book - sit back, relax and enjoy the ride because this books is 'fun' and such a great read! In My Mailbox 4: double edition! So, last week I was too busy, and the week before I only had one book, so there are a lot of books this week. 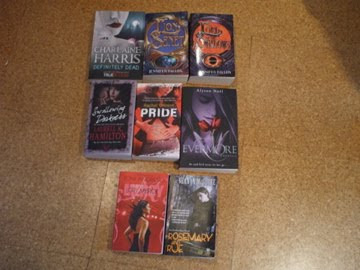 So, books I got in the past couple of weeks! Phew! Loads of great books there, I've had a great time reading this week. What about the rest of you? Get anything cool? What was your favourite?